The 185SA has a pretty good cutting capacity. This device, which has a 1.5-horsepower motor, can slice through up to 3 inches of paper, which is well over 500 sheets. There are 500 sheets in a ream, so that gives you some idea of how powerful this device is. This machine can process paper that's up to 18.5” wide. Thus, you'll be able to work with letter-, legal-, and tabloid-sized sheets. There's a lot of space surrounding the blade so it's easy to cut those large sheets. You can also cut smaller ones, of course. The 185SA has a digital backgauge position indicator that's incredibly accurate. To change the position of the backgauge, all you need to do is turn the hand-wheel located at the front of the device. To ensure you cut right where you need to, this cutter is equipped with a LED cutting light. This line is red so you'll be able to see where your paper is going to be cut. If it's not in the right position, you can then realign it for your desired cut. Using the 185SA is a safe experience thanks to a couple of features. First, you must use both hands when operating it so there's less of a chance of you getting injured. Also, there's a safety shield on the front to keep your hands away from the blade when you're not operating it. This is one of the most durable trimmers around because it's made out of such high-quality materials as cast iron and aluminum. Also, this machine is pretty much maintenance-free so you can spend your time doing other things. The 185SA is a pretty hefty device so it might not be a good fit for all workplaces. Its dimensions are 52.75” (height) x 32.25” (width) x 41” (depth) and it weighs 700 pounds. This machine comes with a stand that's equipped with casters to make moving it around less of a chore. This cutter is a bit pricey, but it's definitely worth the money. It comes with a one-year warranty just in case it turns out to be defective. 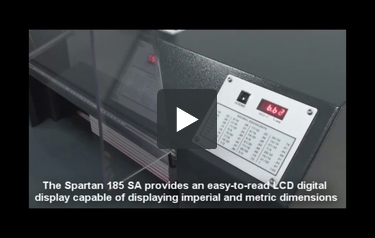 The Challenge Spartan 185SA is definitely a high-quality paper cutter. This machine has a very impressive cutting capacity and it can work with large sheets of paper, so it's perfect for heavy-duty use. You'll find it super easy to get an accurate cut thanks to this device's backgauge position indicator and LED cutting line. Using this machine is really safe so you can have a worry-free work experience. And, perhaps best of all, this cutter is incredibly durable so you'll be able to get a lot of use out of it. So if you're looking for a heavy-duty electric paper cutter, the 185SA is a fantastic choice.